Detergent and polishing spray, enriched with beeswax. Protects, polishes, cleanses and effectively eliminates dirt and stains from both wooden furniture and all modern surfaces. It also leaves a delicate honey fragrance in the room. Notes: A specific product for lacquered and laminated surfaces. Thanks to its formula it deterges surfaces and takes care of them at the same time, without leaving haloes. Shake the can thoroughly before use. Spray the product directly on the surface to treat from a distance of about 25 cm, allow to act for a few minutes and polish with a soft, dry cloth. Natural wood, polished wood, matt wood, painted, enamelled, lacquered, plasticized surfaces. 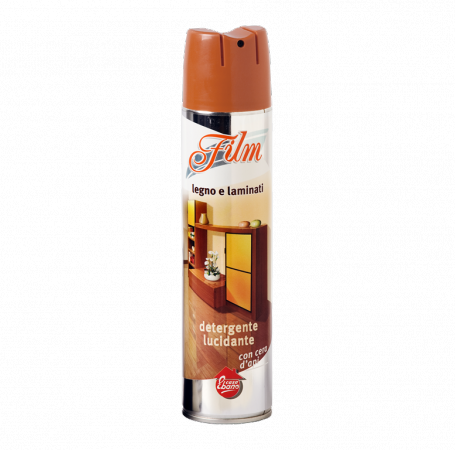 A detergent and polishing spray enriched with beeswax, it protects, polishes, deterges and effectively eliminates dirt and stains both from wooden furniture (gloss or matt, natural or treated) and from all modern surfaces (painted, lacquered, enamelled, plasticized, Formica, etc.) and renovates and shines. Protects from dust, grease marks, fingerprints and water, and perfumes the environment with a delicate honey fragrance.